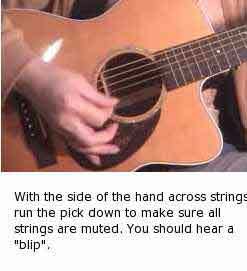 What is The Slap Strum? Here is a little technique that pays big dividends in making your strumming more rhythmic, compelling, and interesting. 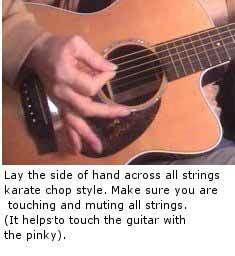 It probably goes by a lot of names, but I have always called it the "slap strum". It is very effective when used with the right kind of songs, and should be part of the arsenal of every acoustic strummer. Here is how is works. 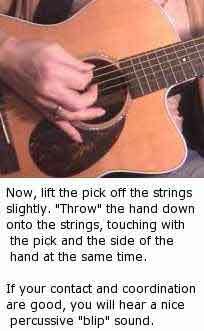 On certain beats, instead of a full strum of the strings, we mute all the strings with our strumming hand, and simply run the pick across the dead strings, creating a "blip" kind of sound. This sound creates a very pleasing rhythmic contrast to the rest of the strums, which carry a full tone. The key to its effectiveness is that it is creating an accent on the beat it falls on. So, this means that it is not used on just any beats (usually, that is, I am sure there are examples of it being used in unusual ways). It is almost always used to simulate the effect of the snare drum in a basic rock groove. The snare drum is used to create what is called the "backbeat", a rhythmic pulse falling on beats 2 & 4 of a 4/4 measure. This sets up a basic syncopation (accent of a weak beat), and the resulting tension of accenting that weak 2nd and 4th beats adds a lot of life to a groove. So, guitar players will simulate this effect right on the guitar by the use of the "slap strum", done on beat 2 & 4 (which are the weak beats in a 4/4 measure), or sometimes just on beat 2. I am going to give you a few simple steps to follow to get this sound. Follow them, and soon you'll be "slapping" your guitar with the best of them! This technique sounds great on a folk-rock ballad like "Best Of My Love" by the Eagles. I would suggest only slapping on the 2nd beat, as this is a laid back kind of song, and slapping on both 2 and 4 would be a bit too much. The rhythm for the strum is written out below. You can copy it by ear, or follow the written rhythm. 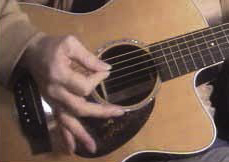 The arrows are the direction of the strum, the circled arrow is the "slap".